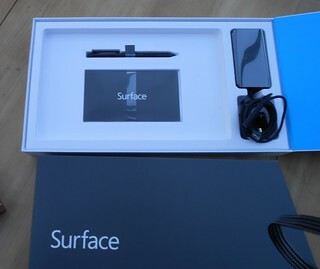 In early September 2013 I bought a Microsoft surface. The box is firm, strong and its easy to both see and feel what to do next, pull the white box out from the darker gray box. It’s a tight fit, but smoothly pulls out revealing a continuation of the simple branding, without the typical set of legal, feature, geeky must-know information. Nice. The white box is opened by a lid, again it’s obvious and easily turned back to open. No latch or catch used because it’s not needed with the sleeve design lf the gray box. Pleasingly simple, it feels like playing pass the parcel with myself, and I’m almost at the prize… The inside of the lid is the same bright blue as the logo on the outside. The surface is right there, wrapped in a shiny cellophane wrapper, not necessary but I loved being able to see it and having yet another level of the present unwrapping feeling. The power cable was wrapped in the same shiny cellophane, given the same gift status as the actual surface. 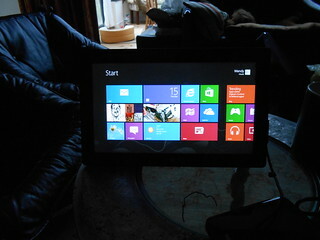 They were Out Of the Box (OOBE) and plugged in within the minute. 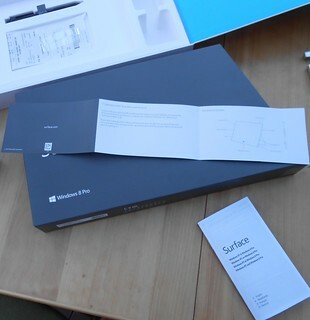 At first I barely noticed the paper user-guide and electronic pen placed under the surface. I didn’t need to notice. The power cable had ‘snapped’ into position on the surface, there was only one place it could go and they were literally magnetically attracted, no need for me to be dextrously precise in placing it. Ooh! NICE! 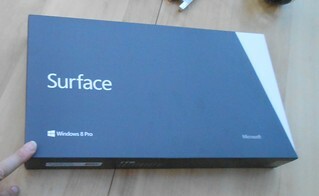 Only 2 buttons on the Surface, one looks like volume so the other must be power. I pressed both as I reached for what I presumed was either a user manual or quick start guide. It turned out to be a 3 page, concertinaed quick start guide labelling all the external hardware features. Easily digested, superfluous yet comforting. There were some minor demo’s of interactions that showed how to find the side controls and search, the bottom of screen controls and the stuff on the right. Possibly some more, I can no longer remember if I was told about or discovered the pinches, flicks, pulls and long-presses. They’re not intuitively discoverable so someone, sometime must have shown them to me.. It wasn’t long until I white screened, while loading my thousands of photographs up to the SkyDrive, which couldn’t cope. 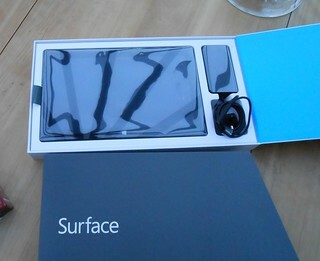 I twitted about this and then got into a frustrating bug-diagnosis discussion with the surface twitter feed. Oh dear, a great start, packaging, went down hill dramatically quickly as the expensive device demonstrated poor usability performance and ill thought-out social media use which merely inflamed my situation. I didn’t learn, over the next few weeks. 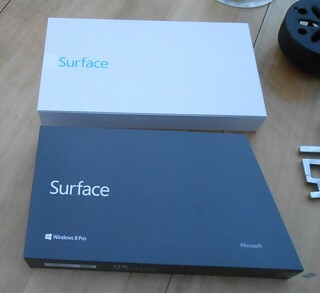 I had several frustrating interactions with Surface twitter who asked me questions I wasn’t able to answer, making me feel stupid, and not making any noticeable progress to solving my problem. Compiling the anti-climax of my first experience.